Editor’s comment: In case you’re wondering what’s driving the whole wind energy mania, here’s your answer. My brother, a Chicago lawyer, once advised me to “follow the money” when looking for answers to questions like this. Lipton & Krauss have followed the “clean energy” money—and it turns out it’s being taken out of your pocket. Halfway between Los Angeles and San Francisco, on a former cattle ranch and gypsum mine, NRG Energy is building an engineering marvel: a compound of nearly a million solar panels that will produce enough electricity to power about 100,000 homes. The project is also a marvel in another, less obvious way: Taxpayers and ratepayers are providing subsidies worth almost as much as the entire $1.6 billion cost of the project. 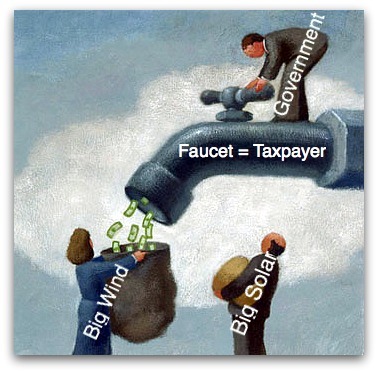 Similar subsidy packages have been given to 15 other solar- and wind-power electric plants since 2009. The government support — which includes loan guarantees, cash grants and contracts that require electric customers to pay higher rates — largely eliminated the risk to the private investors and almost guaranteed them large profits for years to come. The beneficiaries include financial firms like Goldman Sachs and Morgan Stanley, conglomerates like General Electric, utilities like Exelon and NRG — even Google. Click here to read the remainder of this article . . . The article is a sobering look at the staggering public cost of “renewable energy” — and the meager results that have actually been achieved. 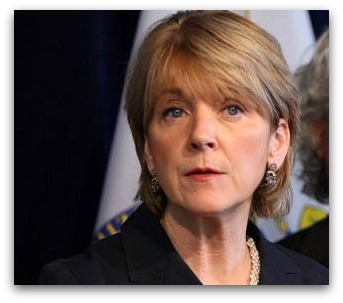 I find this article particularly intriguing in light of the revelation yesterday, in a speech by Massachusetts Attorney General Martha Coakley, that the Green Communities Act is likely to cost Massachusetts residents more than $4 billion. One quibble: the lead paragraph of the article includes a typical misstatement of fact, saying that the solar project in question “will produce enough electricity to power about 100,000 homes.” This is not true. All megawatts are not created equal. Reliable megawatts are useful; unreliable megawatts are much less useful — and abjectly dependent upon reliable sources to come to their rescue when they fail to produce. Wind and solar electricity projects never stand alone. You have to have a serious back-up plan in place — on a moment’s notice — for those times when the wind doesn’t blow and the sun doesn’t shine. Wind energy and solar energy do not “replace” or “displace” conventional energy production. At best, they complement it — after an expensive, and redundant, investment. The wind and the sunlight are free; but everything else costs a fortune to install and maintain. The output is obscenely expensive and the quality is poor. Consumers pay the bills while Goldman Sachs, Morgan Stanley, GE, Exelon, Florida Power and Light and even Google are laughing all the way to the bank. I think it is just great that someone in this so-called recession is getting public assistance. Don’t you think that Goldman-Sachs ought to get everything that’s coming to them? And that goes double for G.E. and Morgan Stanlety, and all those people who have taken such great risks in investing in the Administration’s pet energy industries, notwithstanding the fact that they can’t generate enough power to inflate a paper bag, let alone power zillions of homes. 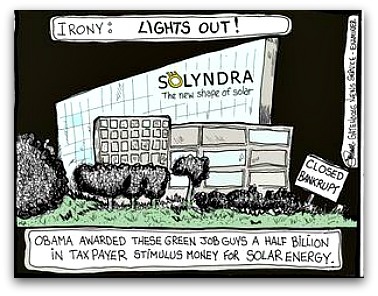 So why do you suppose so many Obama supporters get the warm and fuzzies when their political darling shovels more of their money into the “Solyndra’s” of the phoney energy marketplace? Do you suppose that once, having been sold the “renewable” bill of goods, they are so afflicted by cognitive disonance that even if you tied them to a chair a forced them to read the sad facts about the inability of current renewable energy technologies to free anyone from the need to burn coal, and gas, and to use nuclear energy to keep the lights on, do you think they still might have a few uncontaminated brain circuits to recognize the truth? I wonder?.